For years, I have been exposed to the 1930s-1950s UK transport posters, advertising the dubious attractions of seaside resorts, bits of countryside etc. I have actually got a facsimile of a ‘Scarborough’ poster hanging in my house. 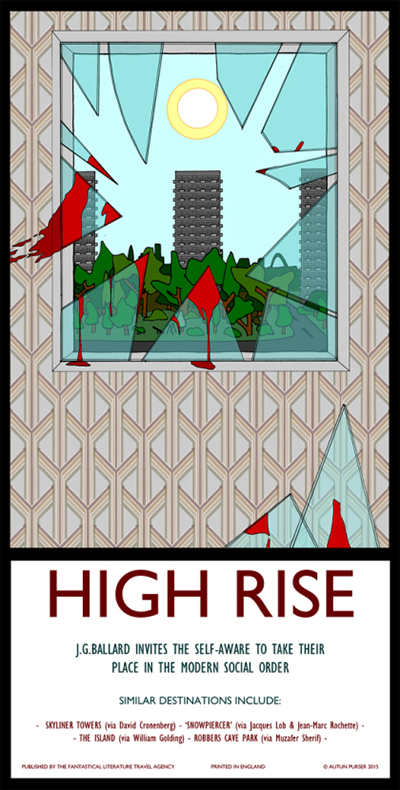 Over these years the formats, fonts, word ratios and limited colour palettes of these designs have seeped into me and have mixed up with my dear love of written science and unusual fiction. For my work I am actually a deep sea marine biologist, rather than a designer or artist, and spend a number of months each year at sea. 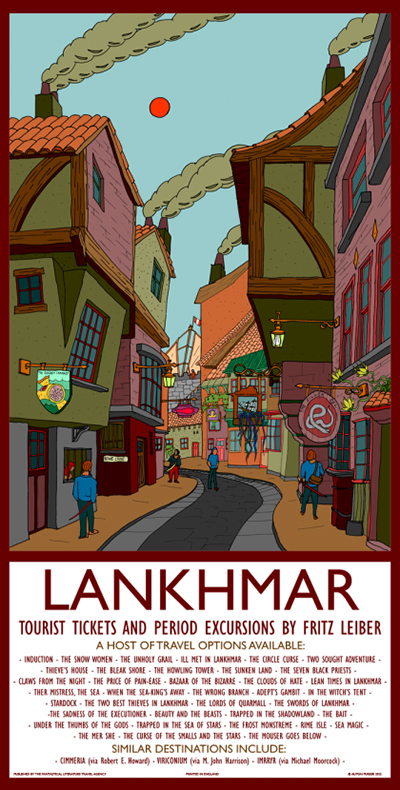 In 2011 I was on a research cruise afflicted with bad weather, mechanical failures and various problems, with little real work to do and no marine samples to illustrate- I had the idea to fill my time by attempting a travel poster design, but advertising the location from the book I was currently reading – Lankhmar by Fritz Leiber, rather than some seaside town. With a near autistic approach to detail, I decided to keep the page formats, fonts, limited colour palettes, text sections (name of location, a little ‘joke’, names of similar destinations etc.) laid out as closely as possible to the tall, door advertisments used for a while at train stations. 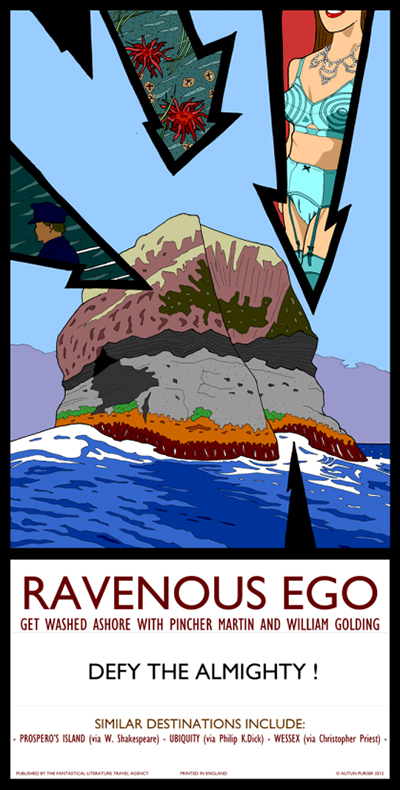 I also decided that the design should be printable at 122 cm x 58 cm at 300 dpi resolution, so as to match the original formats. …but that is getting ahead of myself. 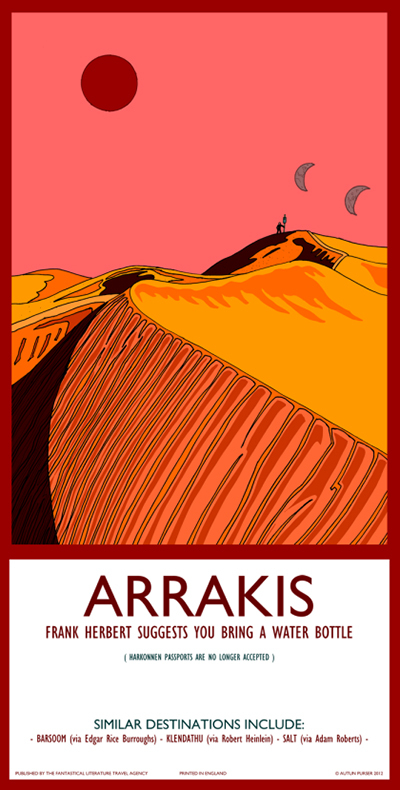 After doing ‘Lankhmar’ I decided it might be fun to have a crack at a few more , so ‘Solaris’ soon followed, as did ‘Arrakis’ and some of the others on my webpage (www.apillustration.co.uk). With ‘Solaris’ I started another trend I continue with – if a book has been adapted for screen or TV, I try to illustrate a location not covered by the adaptation, or focus on details ignored by the adaptation. 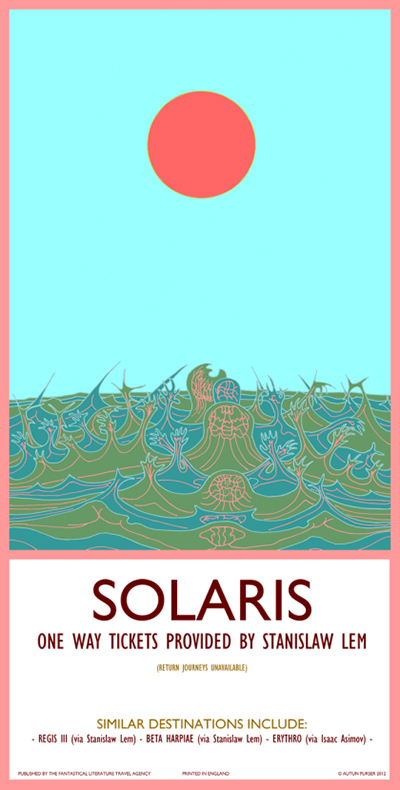 In ‘Solaris’ I really try and show the planet trying to create the giant baby, as discussed stunningly in the book but ignored in all adaptations thus far. 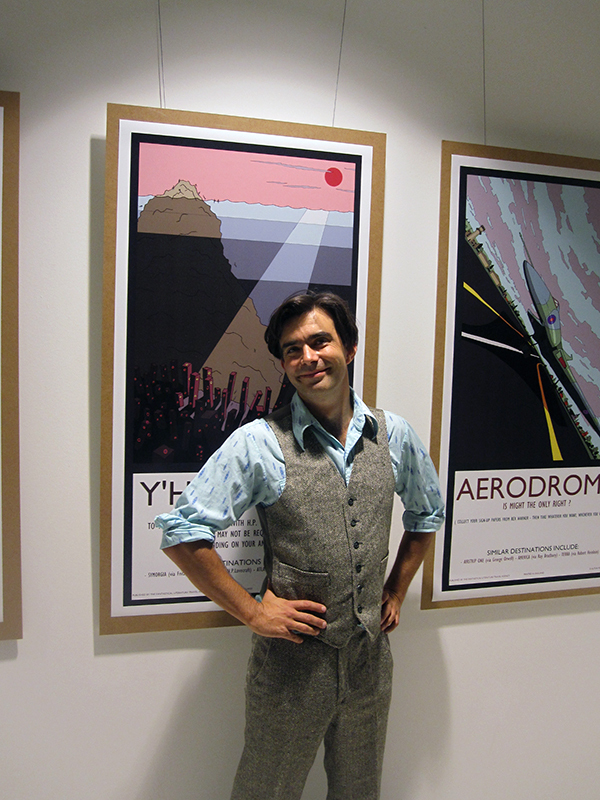 I did 14 posters and put an exhibition on in a university library, with the library buying in the books and promoting unusual fiction. I enjoyed that and decided to design 25 and put out a self-published book. This I also did, and by then it was pretty clear I could not stop. 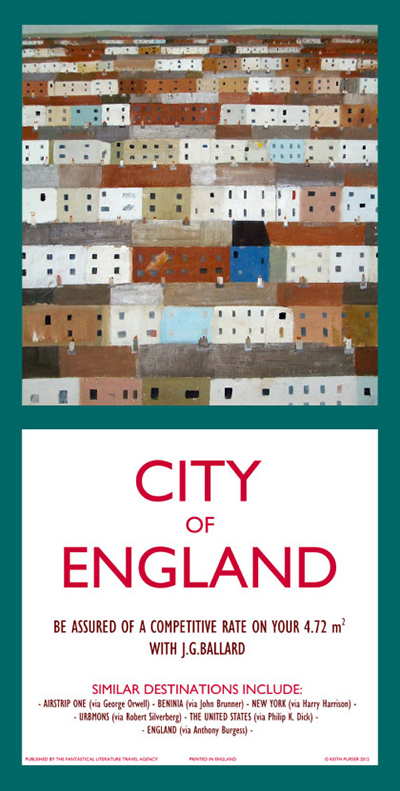 I have designed something like 50 posters now in the range, and also invited several guest artists to make contributions (such as ‘City of England’ here). The range has had some nice publicity on IO9 etc, and I have has some interest from publishers in using some of the illustrations, which as a fan I have really enjoyed. I am also enjoying presenting unusual books such as Pincher Martin (‘Ravenous Ego’ in the poster range) and ‘The Aerodrome’, in amongst the more traditional canon books such as Starship Troopers and Dune. 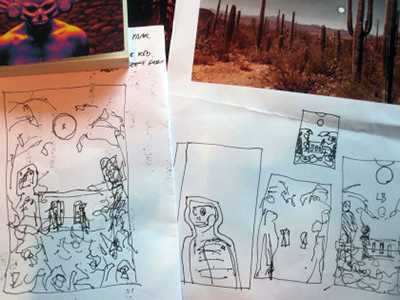 The ‘similar destinations include:’ section is also a great place for me to guide the illustrated reader to the more forgotten gems of written unusual fiction. 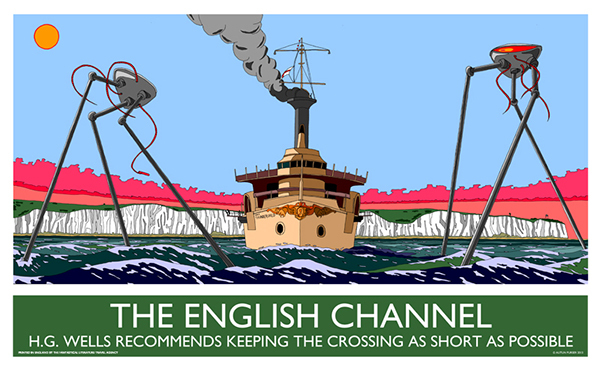 Most of the range is available as cheap ‘print on demand’ posters, with some also available as traditional, manual screen prints. 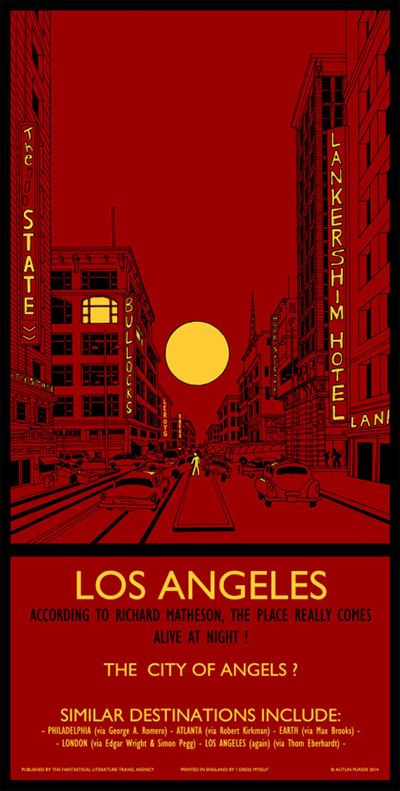 When a design has only a few colours, such as ‘Los Angeles’ here (from I Am Legend by Richard Matheson), screen prints can be made reasonably affordably. 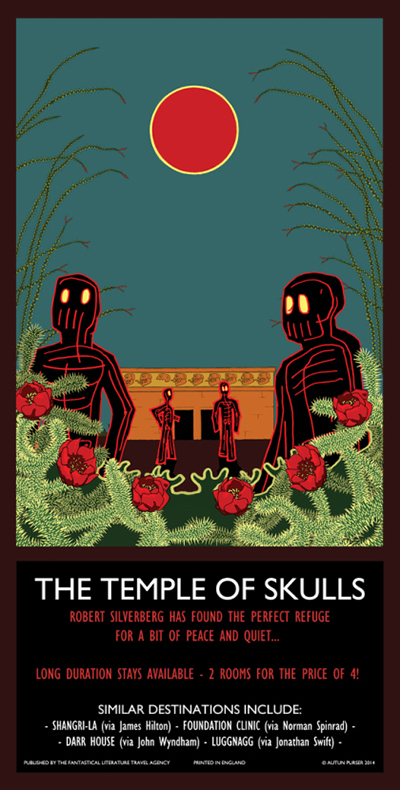 I limit these screen prints to the number of years since the book was written – so 60 for ‘Los Angeles’, more for the output of Verne and Lovecraft, less for that of Christopher Priest. I also sell sets of 40 postcards with many of the designs illustrated within a pack. I have ~80 more designs lined up for the range, so if you are interested, keep an eye on the website www.apillustration.co.uk.